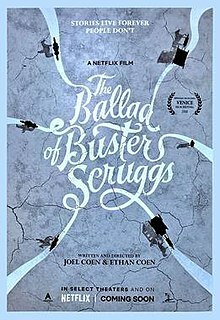 Joel and Ethan Coen’s The Ballad of Buster Scruggs is a compendium movie. It’s a succession of stories literally popping out of the picture book that's used as a device. They’re set pieces that have no particular relation to each other from a narrative point of view. One unifying theme, however, is the filmmakers’ signature brand of grotesquery. In their usual outings the sense of the absurd is countermanded by humor. In this case it’s just misery. The Ballad of Buster Scruggs is a primer on unadulterated and unpolished human suffering. For instance in the first piece Buster Scruggs (Tim Blake Nelson) is a singing cowboy. In one scene of classic Coen brothers invention, you literally see the world from the inside of his guitar. Scruggs kills with a smile on his face. Then one day he meets his match and that’s it. In another a bank robber (James Franco) is outsmarted by a crafty teller. He escapes a lynch mob only to run into series of dead ends, including one, where alone in the middle of nowhere, the rope which was originally being used to hang him slowly tightens around his neck as he attempts to escape. In another vignette Liam Neeson, who runs a traveling freak show, replaces his quadriplegic soliloquist (Harry Melling) with a chicken. In one more a prospector (Tom Waits) digging for gold is also digging a grave. Gratuitous violence and irredeemable cruelty are the salient characteristics of the Coens' contribution to the Western genre. The Ballad of Buster Scruggs has all the blood of Fargo, the Beckettian finality of Barton Fink, the country music of Inside Llewlyn Davis and the visual flare of The Big Lebowski, but ultimately it falls flat. It’s film noir minus the suspense, which is to say, just noir.